It's been a very long time since i've had and shared a finish on a Friday in this little space. I'm glad to be back relatively early in the year with something to share! My first work in progress finish this year was one that was started 3+ years ago! Over the years I have had the opportunity to be a part of various different pieces of the quilting community through bees and things. Many I committed to for a year, then would move on from after my commitment ended. One such bee hasn't been able to shake me - the Stitch Tease Bee. I was fortunate enough to be asked to join in its 2nd year by its founder Diane - we're in our 4th year now and it has been a pleasure to get to know and work with such a talented group of ladies. Anyway, back to the finish! This was the first quilt I asked the ladies to contribute to. Hubby chose the colors and the pattern back when we lived on Maui. Everyone made me gorgeous blocks… and then they sat, until this month when I unearthed them and finally gave them the attention they deserved. I did a tiny stipple in the greys to make the colored portions "pop"off the quilt and I couldn't be more pleased! 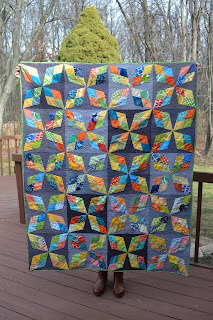 I tend to stray away from tight quilting as I find them to be more stiff and not as cuddly and comfortable personally. This seemed to provide a happy balance of both. 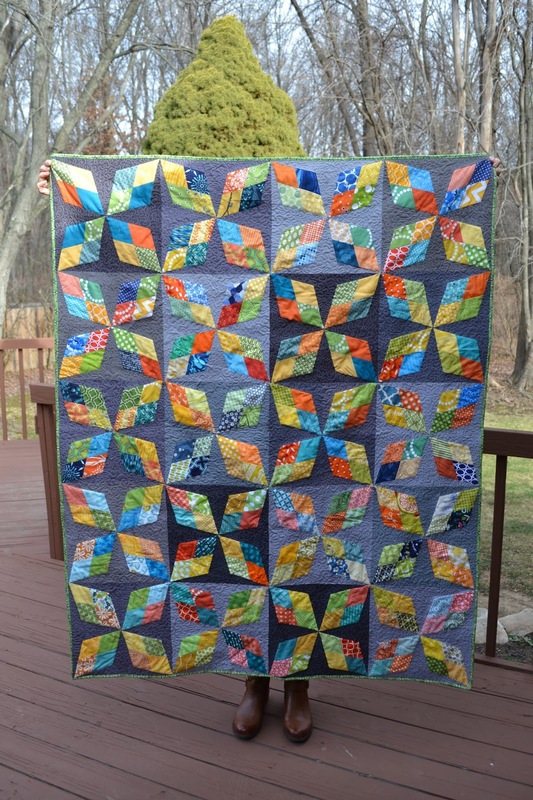 This quilt is ready and waiting for #babyknottedthread to make his appearance! Thank you, thank you again to the fabulous ladies of the Stitch Tease Bee that contributed to this quilt, I love it and I'm sorry it took me so long to enjoy it! What a bright fun finish! I love those colors on all the different grays!! Let us know about your new bundle! I recall getting all kinds of stuff finished up before my first...probably the last time I did so much - ha. Congratulations! Yay for a Friday finish! It's lovely. Lovely quilt. I adore diamonds and your piecing is so precise!